We need a logo for Pak128.Britain. Does anyone have any ideas (or even want to have a go at drawing it?) My only idea is the current simutrans logo with a British flag somehow in the background. I'm sure people can come up with better ideas. Please suggest below - and feel free to attach sketches or examples! We need one 32x32 pixels, and one larger one for the splashscreen. Hmm, the current Simutrans logo features a train that is not very British looking (somewhat German, I suspect). Perhaps we could use some of the .blend files used for some of the in-game graphics and render a simple scene with them? Use a typical british building. The tower bridge, or the parliment building. Or use the british flag. I can probably do this from the blends I have. Which loco? 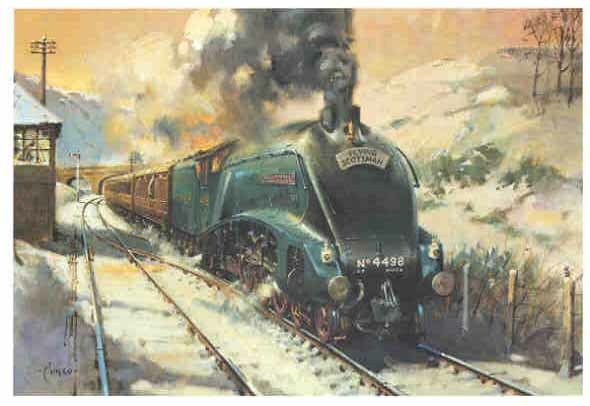 I think possibly the GWR King as I have a very detailed model of that one, so we can get better resolution. Any other ideas or suggestions for the logo as a whole or for which loco we should use? Or perhaps something a little like Terrance Cuneo's painting, "Into the 80s"? (I cannot immediately find a picture of it online). that's not the one that I was thinking of, but that is good classic Cuneo! Cuneo would be hard to replicate, I am no artist (I can just use blender!). Current best plan is to have a steaming GWR King and a routemaster underneath a Union Flag. Here's my first attempt at a small logo and a splashscreen logo. Thoughts? Wow , that looks great! Very nice design! One or two small points - first of all, the flag extending to the corners in the way that it does will make the splash screen logo appear as if it were in a box - if you look at the existing logo, the design finishes against a black background before it gets to the edge of its box, so that it looks like the logo has just been drawn seamlessly onto the black background. Perhaps you could vignette the corners? Also, the right front buffer of the locomotive is just off the edge of the picture - it would be nicer, I think, if it was not cut off. Additionally, the very bottom of the front bogie wheel of the locomotive is cut off slightly. The text could do with being a smidge higher, too, so that there is not such a large black gap between the train and the text. Finally, I'm not quite sure about the font for the "Pak128.Britain" text - I don't think that italic quite works there. The art deco font for the rest is good, though - perhaps use the same font as for the other text, just in a smaller size and that dark red? The small graphic is just a dark blur for me. I have bad eyes and non-standard monitor setting, but still. Consider that unlike the large version, it will be displayed on desktops and file listings, which typically use light background. Then the little contrast within logo is lost against contrast between background and icon edges. Current official logo works well as icon because it lacks detail to lose when scaling down, and is brighter. Thanks for the rapid feedback! Here is v2 of both - the splashscreen incorporating most of jamespetts's suggestions (I can't match the fonts exactly as the simutrans text is taken from the existing splashscreen logo which is pixels rather than font), and the small logo on a white background. Can you see this better VS? Excellent! Perhaps slightly more vignetting? The white small version is a particularly good improvement - it's impressive for it to be so clear when it is so small. You are a hard man to please James Petts! Personally I think the current vignetting works OK on the splashscreen, it's not up there long enough on my machine to be worth spending too much more time on anyway. Ahh, you're probably right. It does look good! Sorry for my two cents. I think the read letters is to dark for some screens.